The Likely Suspects: Talladega fantasy picks are totally literal and figurative. You make your choices, like you do every week, but let's face it, they can be more "fantasy" than almost any other week. Even the best drivers can be victim of the bump-and-run for the win or the ultimate big one. I focus on blending past performance with mastery of restrictor-plate racing. And the truth is, not having Dale Earnhardt Jr. as an option this week is going to be difficult. I will be looking at these drivers to perform well: Clint Bowyer, Brad Keselowski, Martin Truex Jr., Kyle Busch, Ryan Newman, Matt Kenseth, Paul Menard and Jimmie Johnson. My 2 Cents: My no-brainer pick this week is a tie between Brad Keselowski and Kurt Busch. I will round out my team with Ricky Stenhouse Jr., Ryan Newman, Austin Dillon and Paul Menard. I'll complete finish it up with Alex Bowman and Brian Scott. Four active drivers are tied for the most poles at Talladega with one each – Jimmie Johnson, Kevin Harvick, Kasey Kahne and Brian Scott. Although 45 different drivers have won at Talladega Superspeedway over the years, Dale Earnhardt leads them all with 10 victories. Brad Keselowski leads all active drivers with four wins. Richard Childress Racing and Hendrick Motorsports are tied for the most wins at Talladega in the NASCAR Sprint Cup Series with 12 each. 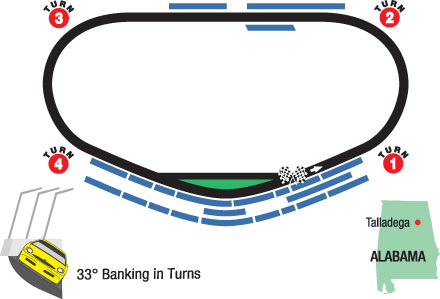 Second place is the most proficient starting spot in the field, producing more winners (20) than any other starting position at Talladega. Ricky Stenhouse Jr. leads all active drivers in the Cup Series in average finishing position at Talladega with a 12.200.